Myth: Black Friday is the biggest shopping day of the year. Black Friday is not the biggest shopping day of the year. In fact, it’s typically not even in the top five, though has cracked the ranks a few times in recent years. The real biggest shopping day of the year is nearly always the Saturday before Christmas, excepting a few occasions where it typically then ends up being the Thursday or Friday before Christmas, when Christmas falls on a weekend day. Thus, the procrastinators seem to outnumber the early birds in this respect. Besides people’s naturally tendency to procrastinate, this should not be a surprise as most people are simply trying to get specific great deals on Black Friday and aren’t tending to look to get all their Christmas shopping done in one day. So while there might be a lot of people in the stores, most of them aren’t coming home with a lot of items, according to consumer reports. On the other hand, the last Saturday before Christmas is the last convenient time for many shoppers to get their shopping done and, for many, they put off shopping for a lot of the people they have to shop for until the last minute for various reasons. So shoppers on this day tend to buy significantly more items per person than shoppers on Black Friday, making it a much more profitable day for retailers. While it may not be the biggest shopping day of the year, Black Friday still rakes in an amazing amount of money, typically bringing in $15-$20 billion worth of revenue each year for the last three years in the United States. Another myth online retailers would love for people to start believing is that the Monday following Black Friday, which is beginning to be known as “Cyber Monday”, is the busiest online shopping day of the year. In fact, Cyber Monday historically doesn’t even make the top ten and before the term was coined and promoted, it wasn’t even typically in the top 30. Most of the actual biggest online shopping days of the year tend to fall between December 5th and December 15th. As someone who once owned a reasonably successful online store, I can attest to the fact that the online shopping days between around December 5th-ish to about the 20th, for my store, would see normal sales jump about fifteen times the normal volume per day on average, during that span; then typically tailing off a bit, but staying well above average until around January 5th, at which point sales tend to see their worst rates of the year until around the end of January or early February when things would begin to get back to normal. The last two Cyber Monday’s I owned that store, I actually saw below average sale rates on that day. The idea for Cyber Monday was supposedly the brain child of Shop.org executives who were trying to find a way to get people to devote more of their Christmas shopping to online sales. A year before the first official Cyber Monday, Shop.org began brainstorming the idea and sent out a mass email to many other major online retailers, hoping everyone would push the idea the following year. Up until that point, most online retailers hadn’t noticed any significant jump in sales on that day vs. any other day around that time. 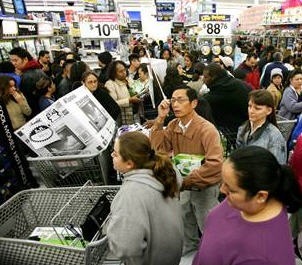 Black Friday, the Biggest Shopping Day of the Year?